Chip stocks rallied Wednesday thanks to a spate of positive news, highlighted by chipmakers Advanced Micro Devices (AMD) and Intel (INTC), which both received fresh buy ratings from a Wall Street firm. Also helping the sector was optimism for a U.S.-China trade deal, which broadly lifted stocks on Wednesday. Chinese Vice Premier Liu He was scheduled to meet with Treasury Secretary Steven Mnuchin and Trade Rep. Robert Lighthizer in Washington, D.C., as negotiations push to close the final gaps in a restructured trade agreement. The Philadelphia Semiconductor Sector Index, known as SOX, rose 2.1% on the stock market today. The iShares PHLX Semiconductor ETF (SOXX), which tracks the Philadelphia chip index, climbed 2.2%. Nomura Instinet initiated coverage of AMD with a buy rating and price target of 33. It also started coverage of Intel with a buy rating and price target of 65. AMD rocketed 8.5% to 29.02 on Wednesday. Intel climbed 2.1% to 55.48. On March 13, Intel broke out of a 40-week cup-with-handle base with a buy point of 54.20. AMD also has a good chance to gain market share in both central and graphics processors, he said. It competes with Intel in central processing units and with Nvidia (NVDA) in graphics processing units. As for Intel, Wong sees the chipmaker potentially driving earnings-per-share growth above top-line growth. On Tuesday, Intel announced the appointment of George Davis as its new chief financial officer. Davis joined Intel from Qualcomm (QCOM) where he had been chief financial officer since March 2013. Before Qualcomm, he served six years as CFO at chip-gear maker Applied Materials (AMAT). Intel held a media event Tuesday to discuss its latest innovations in systems for data centers. It announced new Xeon server processors and Agilex field-programmable gate arrays. Other chip stocks posting big gains on Wednesday included Silicon Motion Technology (SIMO), up 5.5%; Semtech (SMTC), up 4.7%; and ON Semiconductor (ON), up 4.2%. Last week, ON Semiconductor announced a deal to buy Quantenna Communications (QTNA) to bolster its wireless chip portfolio. 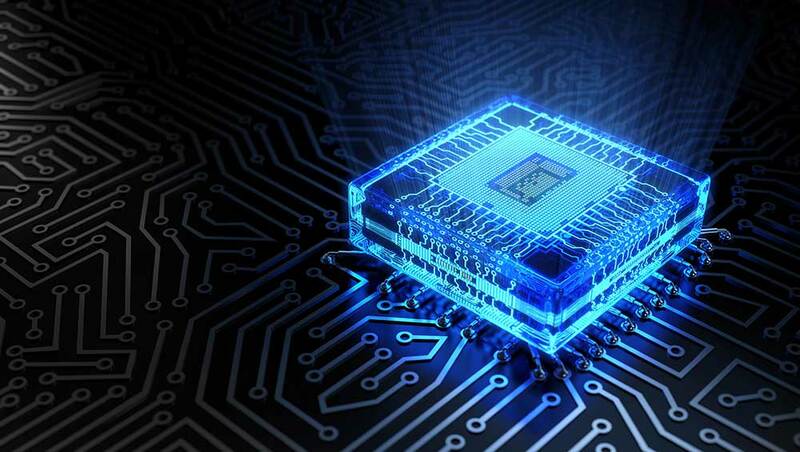 Also Wednesday, DigiTimes reported that Taiwan Semiconductor Manufacturing (TSM) has seen a pickup in orders for its seven-nanometer chips. Follow Patrick Seitz on Twitter at @IBD_PSeitz for more stories on consumer technology, software and semiconductor companies. Semiconductor Companies: Where Are They In The Chip Cycle?